UNLOCKED: Interview with Jason Sizemore! 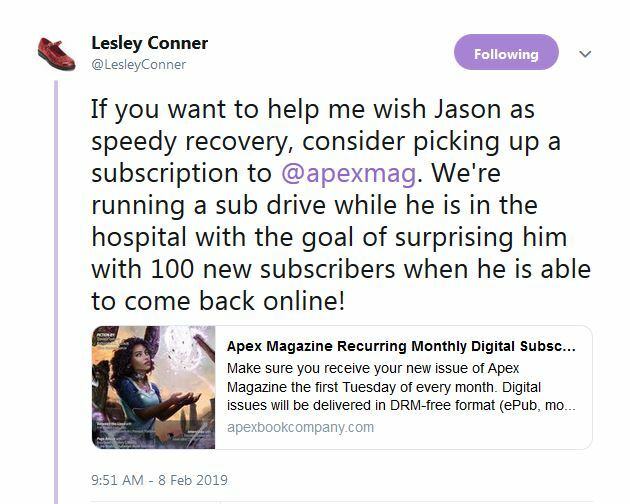 When the Apex Magazine Revive the Drive hit $3500, it unlocked me doing a No Boundaries interview with Jason Sizemore, editor-in-chief of the magazine. The fundraiser reached that goal a few days ago, and we recorded the interview the other night. I had a very short window of time to get questions from Jason’s friends, co-workers, his nemesis, and I even got a few questions from my friends who have no idea who he is. What’s a No Boundaries interview? It’s where I could ask Jason absolutely anything, and no topics were off limits. I did make him blush, but we didn’t get it on camera. Enjoy the interview! And head over to the Apex Magazine Revive the Drive store, pick yourself up a subscription, a subscription bundle, a signed manuscript, short story critique, mystery boxes, book bundle, home made crafts, and brand new in the Drive store are – holy crap there is a copy of The Weird Compendium that is signed by Ann and Jeff Vandermeer! 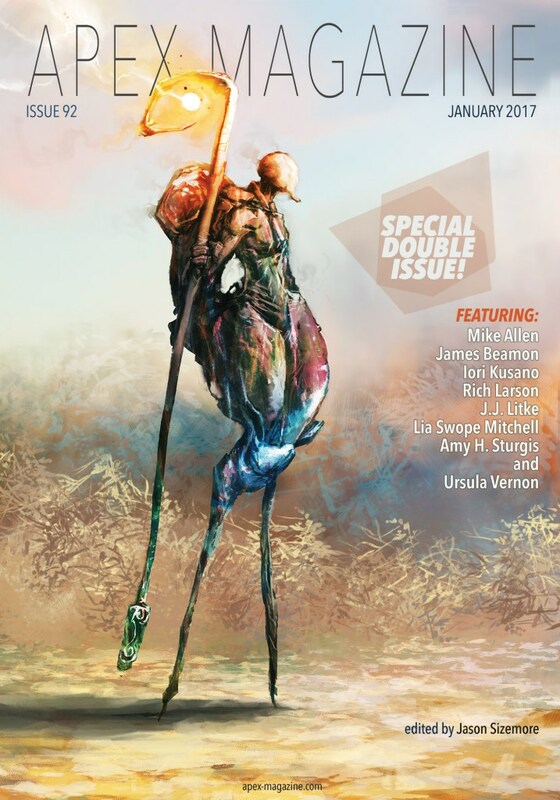 The Drive runs through April 17th, and the funds raised will allow Jason and team to purchase more weird surreal fiction, to pay artists and writers more, and to give fan of the magazine more of what they’ve come to enjoy. A fitting anniversary for a magazine that’s coming up to it’s 100th issue, wouldn’t you say? oh, anyway, here’s a link for the interview. I don’t know how to embed a 22 minute video into a WordPress article. click the link, don’t click this picture. the picture doesn’t go anywhere. What did we talk about? Everything from heated toilet seats, to llamas, to something embarrassing he did at a Con, to who he wants on his Apocalypse team, to famous Apex parties (lots of people wanted me to ask him what’s in the famous Apex Party Punch! ), to books he wishes he could experience for the first time. And yes, we even talked some serious stuff about Apex sales and editing. We’re getting close to the halfway point of the Apex Magazine Revive the Drive, (and holy cow have you seen the awesome stuff in the Drive Store?!?!?!) so let’s catch up with Editor in Chief Jason Sizemore and Managing Editor Lesley Conner! Jason and Lesley let me pick their brains, and it is very important that the resulting document they sent me back was exactly 666 words! Now that I’ve wrecked that word count with an intro and outtro, let’s get to the interview! Andrea: I really loved the print edition of Apex Magazine:SFFH Volume 0. What needs to happen for there to be more of these? Jason: Glad you liked it. I kind of did it in a nostalgic cloud for the old Apex Science Fiction and Horror Digest of yore. Like most things, it comes down to time and money. 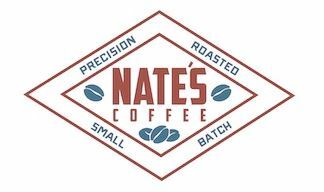 I don’t expect the print edition to make Apex the big bucks, but it has to at least pay for itself and make enough profit for me to buy a bag of Nate’s Coffee. The ultimate answer: more copies need to be sold. Andrea: How many short story submissions do you get in a month? Are there certain times of the year when you get way more submissions, or times of the year when the quantity of submissions dip? Lesley: We average between 800 and 1,200 submissions a month. We definitely get more submissions in January and right after we open after being closed for a while. Other than that, the rate at which we receive stories seems to be pretty constant. Apex Magazine is typically open 9 or more months out of the year, so yeah … we read a LOT of stories. Good thing I love it! Jason: One of the things I’m proudest of is how well Apex Magazine has branded itself. 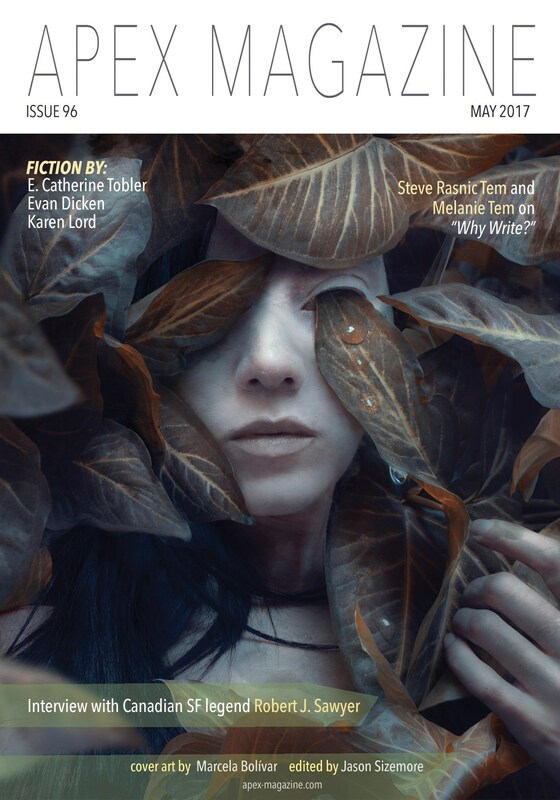 So many of our fans and readers tell me that there is a certain…tone or theme that makes our original fiction standout as an ‘Apex story.’ Writers who read our zine have a huge advantage over those that don’t for that reason. Certain writers from the get-go tap into this with ease: Rich Larson, Lavie Tidhar, Mary Robinette Kowal, Ursula Vernon. I’m big on ideas, characterization, and symbolism. I like stories that carry an edginess. Stories that can tap into my emotions are particularly great, as I’m a rather emotionless editor (okay…this is true of most editors). Lesley: Stories that evoke a strong emotional reaction definitely grab my attention. Also, great characterization and a since of purpose. If I finish a story and immediately want to read it again, then I’m definitely sending it up to Jason. Andrea: What are you hobbies when you’re not working on the magazine? Jason: My favorite hobby is giving Lesley Conner a hard time. Other hobbies include chasing Pumpkin the Apex Cat around the house, playing video games (it’s my mindless escape), ranting about the inequities of life, and reading (of course). Lesley: When I’m not wearing my Apex editor hat, you can often find me doing something cool with my Girl Scout troop. Whether we are camping, going on trips, making a horror movie, baking goodies for our local police officers, or volunteering at the food bank, the girls in my troop really know how to keep me running! If I have a break from both Apex and Girl Scouts, then I’m doing something … calmer. Reading, hiking, yoga—things that are nice and relaxing amid my chaotic life. Andrea: Who are some of your favorite authors? 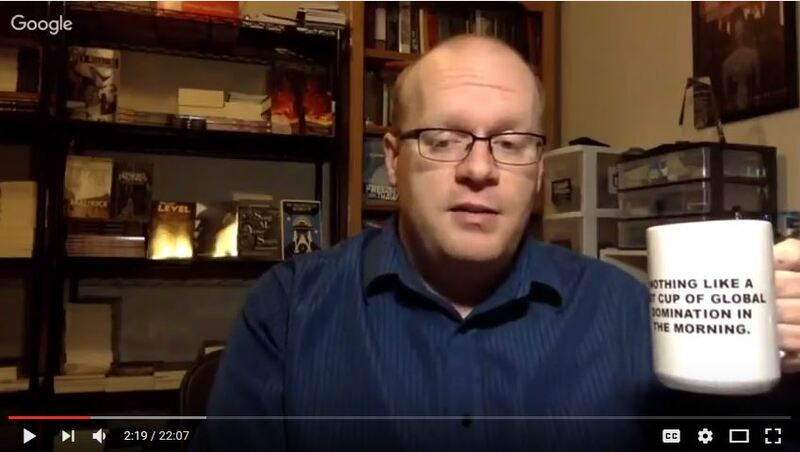 Jason: Some favorite writers include Nick Cutter, Ben Winters, Nisi Shawl, Cat Valente, Cherie Priest, and Nick Mamatas (but please don’t tell him). My writer crush is Jacqueline Carey. Lesley: How much room do I have to answer? 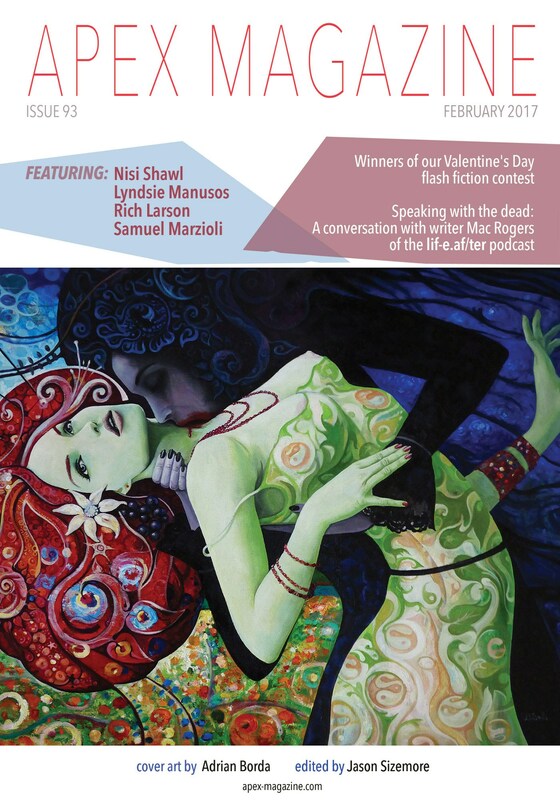 For short fiction, I adore Rich Larson, Damien Angelica Walters, E. Catherine Tobler, Douglas Warrick, Sarah Pinsker, A. Merc Rustad, Iori Kusano, James Beamon … There are so many fantastic authors writing really stellar short fiction right now; I could go on and on. For longer work, I will pick up anything and everything by J.F. Gonzalez, Sarah Pinborough, Cherie Priest, David Wellington, Shirley Jackson, and Katherine Dunn. I’ve recently read books by Consuelo Saah Baehr, Laura Hillenbrand, Fredrik Backman, and Paolo Bacigalupi and really enjoyed them so I’ll definitely be looking for more. … I may have a slight reading habit. Andrea: Thanks Jason, Thanks Lesley! I really have no idea how those to do it. They must have some kind of time creation machine that lets them have 32 hours in each day. Hey, did you know? The $3500 award in Revive the Drive is me getting to harass interview Jason over Skype! Which means I need all sorts of fun questions. The above interview was informative and all, but those were some gentle questions, wouldn’t you say? Give me some suggestions of both heavy duty and crazy things to ask Jason! If the video goesn’t go viral on YouTube, we’ve failed in our mission! I’ve been involved with Apex Magazine since sometime in 2014. I met Jason Sizemore and Lesley Conner at a convention, we hit it off, I did some slush reading, and before I knew it I doing author interviews in the magazine every month. Getting to read someone’s forthcoming story months ahead of time, researching the author, putting together engaging interview questions, writing an intro that hopefully gets your attention . . . if you’re a nerd like me this is the best gig ever! And it really is the best gig. I’ve gotten to interview authors such as Nisi Shawl, John Hornor Jacobs, E. Catherine Tobler, A. Merc Rustad, Benjanun Sriduangkaew, Ursula Vernon, Chikodili Emelumadu, Brian Keene, Damien Angelica Walters, and Seth Dicksinson, just to name a few (and I realize I’ve just named a bunch of my favorite authors, as well. bonus!). I know from the outside, it looks like Apex Magazine magically comes together every month, but it isn’t magic. It’s a lot of time, passion, and hard work from the people involved. And I’m just the smallest, tiniest part of how the sausage gets made. Apex Magazine is currently in their 2017 subscription drive. What’s a subscription drive? It’s where you can buy subscriptions (now only $17! Less than a $1.50 an issue! like, you can’t get a cup of decent coffee that cheap), you can buy stuff (artwork! signed books! handmade blankets and hats! critiques! ), Lesley Conner will send you an awesome postcard! And there are stretch goals for more stuff. Reaching $10K means the magazine can pay their authors more, buy more stories, hire another editor, and do all sorts of amazing things. more awesome fiction from Tade Thompson! 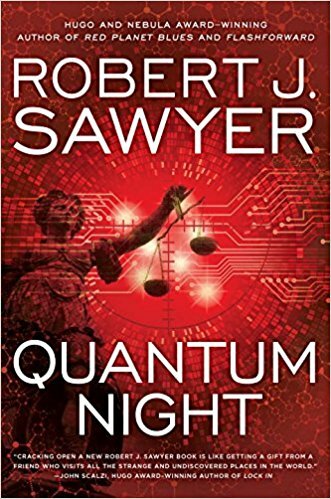 You know, that guy who wrote Rosewater, one of the most unique alien invasion stories I’ve ever read? Jason and Lesley torturing and teasing each other about It Follows. Me having the opportunity to ask Jason all sorts of goofy and embarrassing questions over Skype. more fiction from Delilah Dawson, Cherie Priest, and Jacqueline Carey! There’s about a bazillion more stretch goals, but those are the ones that will benefit YOU, as a magazine reader, the most. Oh wait, you’re not a reader, you’re an author or an artist? Stretch goals for you include paying you more money. 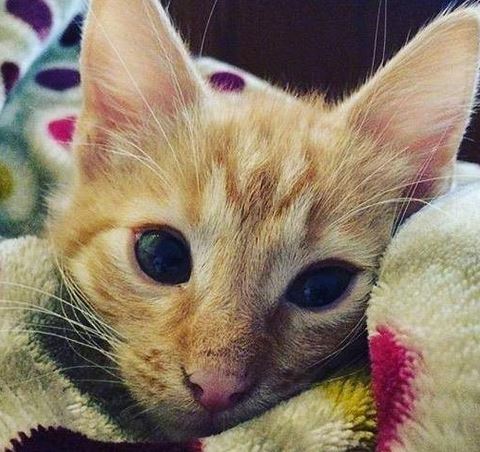 the first stretch goal, has already been unlocked, so you better go vote in who is more adorable – Oz the dog or Pumpkin the cat. I think I’m gonna have to snuggle with both of them for at least 3 days before I can come to a decision. Some of you already read Apex Magazine, or other online magazines such as Lightspeed, Uncanny, Beneath Ceaseless Skies, or others. But some of you aren’t onboard with electronic magazines, and that’s totally OK. You’re more the Magazine of Fantasy and Science Fiction and Asimov’s type. Trust me, I get it. I’m all about teh dead trees. And I have something just for you! 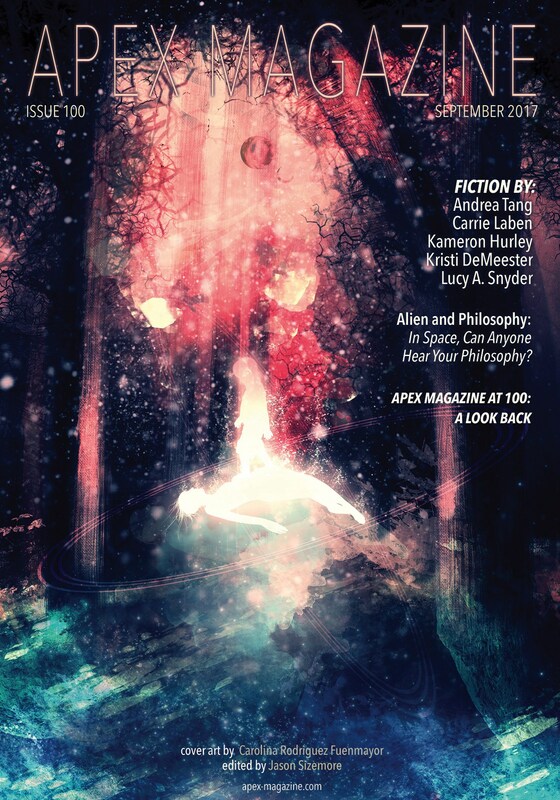 Apex SFFH: Issue Vol 0 – this is a gorgeous print issue, a sampler of 2016. It includes essays, short stories, novel excerpts and interviews, and can be yours for only $8! And oh yeah, I’m in it! As a HUGE fan of dead tree magazines, I am a cheerleader for the Print Issue. I don’t know how many Jason needs to sell for it to be worth it for him to print more volumes, but I want to get there. Getting Apex (hi Jason!) to do a dead-tree full length sampler once a year is a personal goal of mine. Apex prints dead-tree versions of anthologies and novels too! Imma make this super easy. 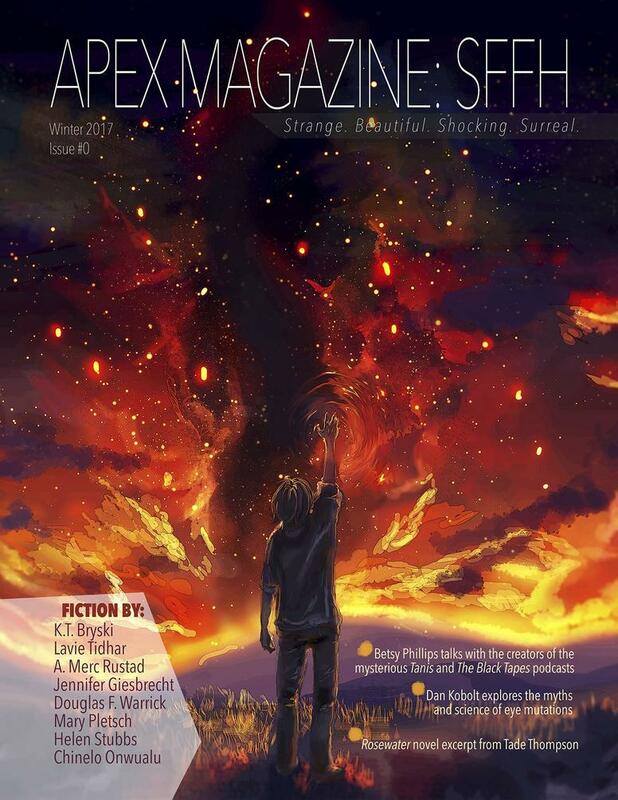 Here are my top pics of Apex print copy goodies: the just mentioned Apex SFFH: Issue Vol 0, Rosewater by Tade Thompson, Shine Your Light on Me by Lee Thompson, Stay Crazy by Erica Satifka, The Best of Apex Magazine, The Apex Book of World SF series, and For Exposure by Jason Sizemore. if you don’t care about any of that stuff, go check out some sweet anthologies and novels printed by Apex. ok, so what are you waiting for? go forth and Apex! Apex Magazine Crossword Puzzle and subscription give away! 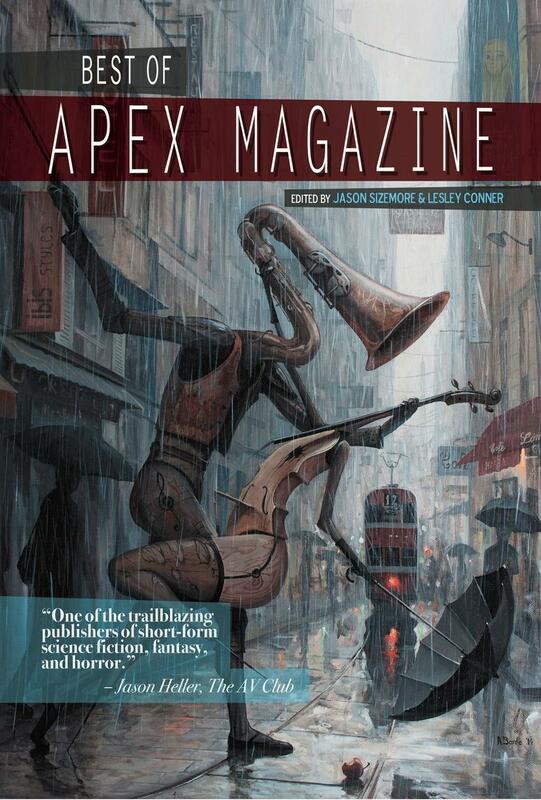 Did you know the Apex Magazine Subscription drive is going on right now? More subscribers means more fiction for you, and a higher pay rate for the authors who create all that amazing fiction. 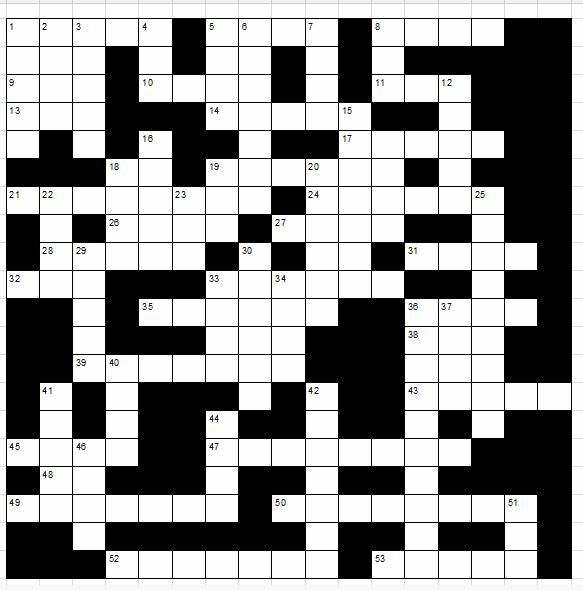 To send some happy attention towards the Apex Mag subscription drive, here’s an Apex Magazine crossword. 85% of the answers to the crossword can be found at the Apex Magazine back issue site, 15% can be found on the Apex Publications site, and 15% are just random words I used to make the puzzle (mostly) work. Put an answer or two in the comments and I’ll enter you in my international give away for a subscription to Apex Mag. You can read the magazine on your kindle, nook, smartphone, tablet, and probably some other gizmos I’m not even aware of. you need to put an answer to one of the crossword clues in the comments. You need to comment that you’d like to be entered into the give away. Putting a puzzle clue answer in the comments is cool too, but not required to enter. I’ll randomly choose a winner from the comments on November 7th. When commenting, please leave your e-mail, twitter, or some method by which I can read you.